Ilayathalapathy Vijay's Puli is shaping up in a fast pace and the makers are planing for a release on September 17, considering the long 4 day weekend for Vinayagar Chathurthi. One of Vijay films' regular distributors Boss Siva updated the same through his Twitter space. This information is being greeted with great buzz in the online space by Vijay fans and movie buffs. As reported regularly, two songs are being shot abroad now with Vijay and the two lady leads, and the film's shoots would be wrapped completely by this month-end. Talkie portions have already been wrapped. Puli is a fantasy entertainer with heavy doses of VFX and CG shots and is one of the most eagerly awaited multi-starrers across the country. ‘Puli’ has an ensemble cast with Vijay, Shruthi Haasan, Prabhu, Sridevi, Hansika, Sudeep, Nandita Sweta, Sathyan, Karunaas, Imman Annachi, Robo Shankar, Thambi Ramaiya and Vijayakumar. Cinematography is by Natty Natraj, Music is by Devi Sri Prasad, Production Design by T. Muthuraj and editing by Sreekhar Prasad. Sri Thenandal Films are said to have grabbed the theatrical distribution rights. It is well known that Kaththi and Poojai released on the same day last year. 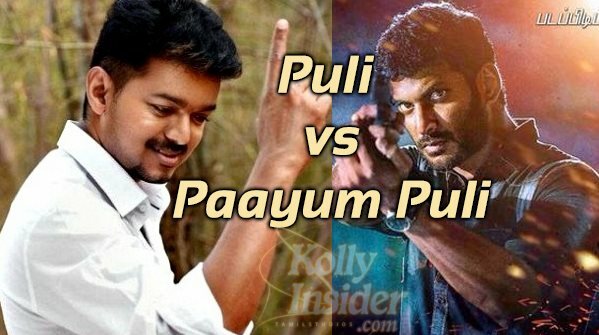 But according to industry insiders, it is said that Vijay’s Puli and Vishal’s Paayum Puli might release on the same day this year. Vishal is now working on Paayum Puli which is fast nearing the completion of its talkie portions. Few days earlier we reported that Paayum Puli was eyeing Vinayagar Chathurthi release. Paayum Puli has completed 25 days of shooting in Suseenthiran direction in Avadi, Chennai. Vishal Film Factory presents Paayum Puli casts Kajal Aggarwal as the heroine, while Samuthirkani, Soori, Jayaprakash and Anandraj will be seen in a key roles. Imman is the music director. However, Puli involves a lot of CG which will take some time to be completed. If things go as planned, we are all set for a Vijay – Vishal clash in 2015 too.